What to do while in Auckland, New Zealand? Blog - What to do while in Auckland, New Zealand? Home Blog What to do while in Auckland, New Zealand? The vast majority of people coming to New Zealand enter through Auckland International Airport and often end up spending at least a day here. As a result we regularly get asked what there is to do in Auckland? As a born and bred Aucklander I put together a few suggestions that will keep you entertained in the city of sails during your stay. For those wanting to stay in the central city Auckland offers excellent boutique shopping, numerous and varied restaurants & bars and Sky City Casino for anyone wanting a flutter. There is also the Auckland Museum and several other landmarks well worth visiting and these have been detailed in many other articles and guides. Auckland is probably most renowned for its iconic harbour and many islands studded throughout the Hauraki Gulf. The majority of these can be accessed from downtown Auckland City either by ferry or a private charter. The most populated and easily accessible of these would be Waiheke Island. 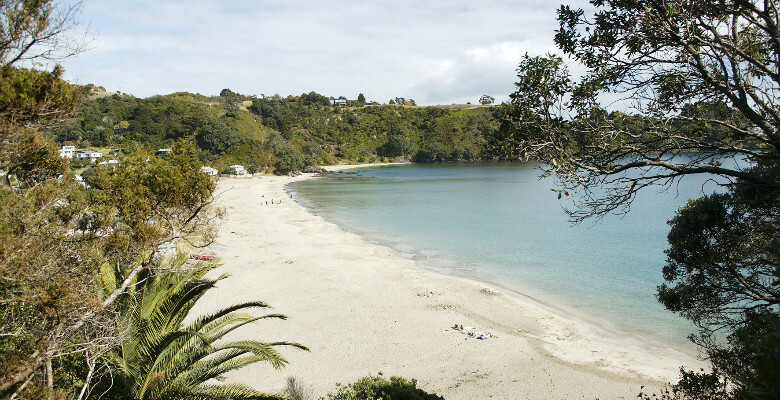 Popular with locals and visitors alike Waiheke Island is abundant with picturesque north facing beaches, numerous wineries and olive plantations along with restaurants bars and cafes all within a 35 min ferry ride from Auckland city. Recommended places to stay are The Boatshed and Delamore Lodge among others, including many private villas. The largest and arguably most spectacular of the islands in the Hauraki Gulf is Great Barrier Island – roughly 3 times the size of Waiheke Island and 10 times less populated, Great Barrier is a secluded paradise which can be easily accessed either by ferry, a short flight from Auckland airport or by helicopter from a variety of locations. Expect a very different experience from Waiheke Island, Great Barrier is more rustic in its charm and while its only 30 mins from Auckland you may feel you’ve stepped back in time. It comes highly recommended especially if you enjoy the outdoors and like going off the beaten track. If you wanted to stay a couple of nights I can recommend Oruawharo as an excellent choice. For those of you feeling energetic the unmistakable Rangitoto Island offers a climb to the summit roughly the same height as Aucklands Sky Tower. Further afield Tiritiri Island is an open nature reserve and home to endangered native birds such as little spotted kiwi, takahe, kokako, brown teal and tieke. In and around the islands of the gulf sailing, dolphin & whale watching, cruising, fishing & diving are popular pastimes and one of the highlights of living in the ‘City of Sails’. For land lubbers the Waitakere ranges 25 mins west of Auckland city offers lush sub tropical bush laden with native Nikau Palms, Kauri, Rimu and Totora. There are numerous hikes and walks that can be taken alone or with a guide. Once out west you wont want to miss the black sand beaches of Piha, Bethells, Karekare and Murawai. They are wild, rugged and invigorating – perfect for the surfer in you with excellent breaks right up and down the coast. For the more adventurous and if you don’t mind getting wet, Canyoning in the waterfalls of Piha is a must. Also out west, Woodhill Mountain Bike Park is an excellent all weather mountain-biking venue 35 mins from Auckland – with over 60 trails and bike hire to boot, its the perfect place to blow out the cobwebs after a long flight. While there you could also try Tree Adventures, a novel way to enjoy the forest in an adventurous way, better know as accrobranche by the French translating as literally ‘tree climbing’. If golf is your thing then Auckland is a great place to play with a larger number of quality courses located near the central city and surrounding regions. Some of the better know golf courses are Formosa Golf Resort, Titirangi Golf Club, Gulf Harbour Country Club and The Grange Golf Club. Further north you’ll find the winery region of Matakana and its nearby beaches Pakiri, Omaha and Tawharanui. Plenty of places here to taste local wines & delicacies and make sure you check out the local Matakana Farmers Market which is held every Saturday morning. Tawharanui is also an excellent place to surf when the conditions are right and the entire coastline is renowned for its fishing, diving and kai moana (Maori for seafood). Theres a couple of ideas for you and of course there are many more depending on what your interests are. Please contact us for further information on any of the activities or accommodations above.